One of my favourite Artists from DeviantArt, I've featured her before, but as she has since moved her host pages, I thought I'd update her listing. Natalie Shau is a mixed media artist and photographer based in Lithuania (Vilnius). Her work is rich, dark and well worth looking at. Her prefered areas are in fashion and portrait photography as well as digital illustration and photo art. Natalie also creates artwork and photography for musicians, theatre, fashion magazines, writers and advertising. You can find her dark, but often whimsical work at Natalie Shau and Deviant Art. As a fan of comic art, there are many artists whose work I enjoy and collect. Phil Noto is a perfect example of just such an artist. 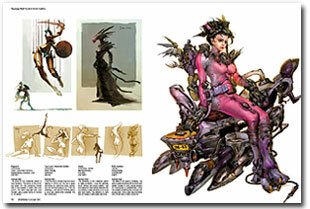 He's produced covers interiors and illustrations for most major characters. His work on Danger Girl, Batman, Beautiful Killer and other characters has a very unique look. The illustrations are for some reason reminiscent of the 60’s and indeed very cool. I like his style, because, it, like many of my favourites, stands out and is immediately recognizable. His work fetches good prices in the auctions and is well worth a look. To see more of his work please visit Philnoto.com and his Blog. although simple is well worth a visit for some very beautiful images. Todd Lockwood is a fine Fantasy Artist who was born and raised in Boulder, Colorado. He had the Rocky Mountains as his backyard, Was a big fan of Sci-fi and fantasy flicks and TV. His early passion for Tolkien and Dungeons and Dragons were part of what shaped him into one fo the finest fantasy Artists around. He's a big dan of Role-Playing which he's been doing for over 25 years. He is also a fan of one of my favourite subjects and someone whom I respect greatly, namely Mythology and Joseph Campbell. Solo a Star Wars Story is the latest Star Wars movie in the franchise. As always a plethora of products are produced to accompany the movie. For myself and many other fans, none is more interesting than the "Art of Solo A Star Wars Story" which delves into the creative process and concepts which go into making the movie happen. The book published by Abrams Books, features 256 lavishly illustrated pages. The Art of Solo ... provides background info and excellent examples of work from the artists, designers, and other members of the Lucasfilm team. I enjoy these books because of the wealth of information about how the movies were created and they are filled with tons of concept art that shows both what went onto the screen and also quite a few designs which never made it. This book is a must have for both fans of the Star Wars Saga and for those who love the art which goes into making these richluy detailed movies. EXPOSÉ 12 announced and will be crowd funded. Ballistic Published have announced the pending release of their latest edition of their popular and gorgeous Exotique books. Exotique 4 firmly establishes itself as the benchmark for CG character art featuring the work of artists from 45 countries. EXOTIQUE 4 includes more art from China, Korea, Indonesia, and Singapore and showcases a broader range of styles and cultures. The work of 215 highly-talented artists fills EXOTIQUE 4 with 322 pieces of inspiring character art in genres from science fiction, fantasy, and anime, to photorealism and stylized realism. 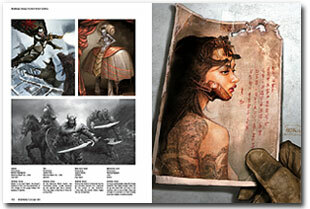 EXOTIQUE 4 also packs an additional 30 pieces of artwork into 16 more pages than the previous edition. Go to the Ballistic Publishing website to flick through the book. Ballistic Published have release their latest edition of their popular and gorgeous EXPOSÉ books. EXPOSÉ 6 which was judged by an international team of leading artists features 334 inspiring images prepared by 257 artists from 43 countries, you will discover the very best work across 20 different categories. EXPOSÉ 6 includes the work of 108 unpublished artists. This latest volume in the d'artiste series from Ballistic Publishing is a sequel to the excellent Digital Painting book which featured digital artists Linda Bergkvist, Phillip Straub, John Wallin and Robert Chang. Like all books in this series, Digital Painting 2 follows a similar format and features some of the works and also tutorials from several talented artists in this field. It also features selected works at the end of each guest artists section in which the artist comments on the piece being shown. This volume features digital artists Don Seegmiller, Mélanie Delon, Daniel Dociu and Marta Dahlig. visit the product page for more information. As usual d'artiste: Digital Painting 2 is presented in Slipcased and Limited Edition versions. Ballistic Publishing have announce that you can now preorder the newest edition of their excellent Expose series. EXPOSÉ 6 features the usual selection of excellent artwork, with 334 inspiring images prepared by 257 artists from 43 countries, it showcases the very best work across 20 different categories. As usual there are 3 editions of this book and the first 300 purchasers will be gifted with 8 prints and a CD with a specially commissioned 15 minute Video Tutorial from Linda Bergkvist. 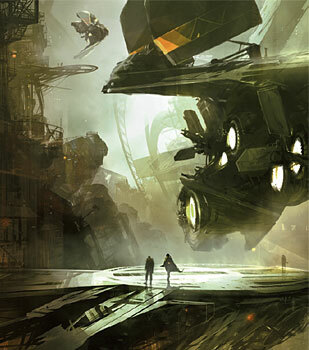 Syd Mead has been awarded the Grandmaster Award for this edition. Click here to pre-order your book. Sketchfeed is a blog based community dedicated to covering art and artists who work in concept art and digital illustration. The blog covers the work from artists such as Jason Chan, Xavier Marquis and Andrew Jones. Pop on over to Sketchfeed.com/ and have a read. Photo Credit: Preston Gannaway/Concord Monitor from her Pulitzer Prize-winning photo-essay "Remember Me." Preston Gannaway is an award winning photojournalist, who works for the Concord Monitor, in New Hampshire. I came across her work, after reading a recent post on one of my favourite sites - http://theonlinephotographer.com/. Prestons work is beautiful, challenging, insightful and inspiring. She tells stories with her images, that hold you and make you want to see more. A lot of her images have a peek-a-boo quality without the feeling of being voyeuristic. Many of her images use off centre compositions which are framed in unusual ways by the objects and environments in which they are shot. Her Photo-essay "Remember Me" was the first to draw my attention because of the Pulitzer Prize it won, however the rest are equally of note. Visit her personal site at prestongannaway.com it'll be well worth your time. I was shocked to find out today that Dave Stevens passed away at the age of 52 on March 11th 2008, from complications due to leukemia. The creator of the Rocketeer and popular cover artist during much of the 80's and 90's, will be missed, greatly. Dave Stevens is survived by his mother, Carolyn; his sisters, Jennie and Melody; and his brother, Dan. There is a memorial page at the Dave Stevens official website. About a year ago I launched Creative Imaging News and in that year I've been busy working on reviews, news and info dealing with creative imaging, photography and art tools and products. Artsites was constantly on my mind ... I wanted to continue with this site as there are just so many interesting and cool places out there to get inspiration ... so about a week ago I rolled artsites into CIN. Now to begin updating the blog, which I'll be doing about twice a week. Ballistic Published have release their latest edition of their popular and gorgeous EXPOSÉ books. EXPOSÉ 5 which was judged by an international team of leading artists features 298 examples of the world’s best digital art prepared by 218 artists from 45 countries. EXPOSÉ 5 includes the work of 108 unpublished artists. Corel today announced Corel® Painter™ X, the latest incarnation of one of the best natural media centric software tools for digital artists. Painter™ X can now be preordered at Corel and Corel UK . New tools include performance improvements, new composition tools in the form of Divine Proportion and their powerful and innovative RealBristle™ Painting System that provides bristle level control over their organic painting and illustration tools. They've also made substantial improvements to the way Painter allows you to turn photos into works of art. I've been a long time fan of Painter and looking forward to trying it out. For more information visit Corel. Corel® Painter™ X is available for $419.00 USD or UK£492.33 for the full version and as an upgrade from $219.00 USD or UK£257.33. I think the only complaint here is the relatively high price in UK £ when compared to the US Price and conversion rate. Sam Haskins is a photographer whose work has graced the pages of many fashion magazines and advertising campaigns. A prize winning photographer and early imageer whose work features the human form, still lifes, travelogues, surrealist influences and graphically powerful compositions. He was one of the first photographers to pioneer the production and publishing of photographic essays. His first book Five Girls - 1962, created quite a stir when it was published in the early 60's. His second book Cowboy Kate and Other Stories - 1964, was so well received it was awarded the Prix Nadar. Sam has been at the forefront of the creative manipulation of photography and has been especially innovative in his use of non digital techniques. Sam is also a convert to digital and spends many hours working with Photoshop. I've been told he continues to shoot with his much loved Pentax 6x7 and scanning his negatives and transparencies with an Imacon and printing on an Epson 7800. Visit his site and blog for more information. Marco Djurdjevic is one of the current cover artists of Marvel Comics, he also works with Massive Black. His images are both powerful and highly imaginative, however he insists he that all his work is drawn entirely from his imagination. With over 10 years experience to draw from as a freelancer and concept designer, he is an example and an inspiration to many. He has produced covers recently for Blade, Daredevil, Spiderman and X-23. His personal website is currently being worked on, bookmark it, as it will definitely be worth visiting, his blog SIX MORE VODKA is active however. If you look for his work, search on google and you will find features and galleries on ConceptArt, CGTalk and Pen & Paper.